Our Riding Centre has something to offer both the novice and the accomplished rider. We provide highly qualified, experienced staff, well schooled horses and ponies, and provide a wide range of treks. 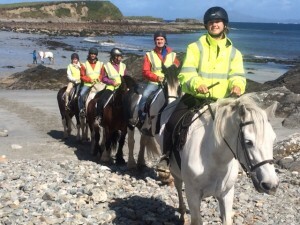 We have 1 hour, 2 hour and ½ day rides through rugged, yet breathtaking, Connemara landscape, beach, mountain and turf terrain. Picnic lunch rides are also available. Approved hats are provided and a selection of boots. 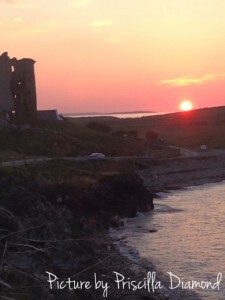 We have a fantastic 3 hour trek to visit Grace O’Malley aka Grainneuaile the Sea Pirate’s Castle in Renvyle, this trek taking along the Mountain, to the Castle and along the Beach offers breath taking scenery. This trek requires experience and departs every morning at 9.45am during the summer season. Price also includes a picnic lunch. Bring your camera for this! Booking is essential as places are limited on this trek. Our Connemara Performance ponies have been exported the world over. If you are looking for a Connemara Performance Pony, then look no further, we have a potential champion for you. Come and “Try before you Buy”. Please see our Connemara Performance Pony exclusive site www.theconnemarapony.ie for further details.